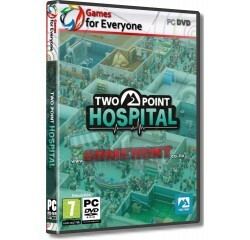 Two Point Hospital - R120,00 : Game Hunt, Where we lead, others follow. Build up a hospital from nothing to a masterpiece as you design the most beautiful - or functional - healthcare operation in the whole of Two Point County. Cure unusual illnesses - Don't expect Two Point County to be populated with your usual types of patients. In this world, you'll experience all kinds of unusual illnesses; from Light-headedness to Cubism - each requiring their very own special type of treatment machine. Diagnose illnesses, build the right rooms to handle them, hire the right staff, and then get ready, because curing just one of these illnesses is just the beginning. You can handle a single patient - but can you handle a Pandemic? Once you've conquered an illness, research improved cures and machines and turn your hospital into an unstoppable healthcare juggernaut. Once you've cured the residents of a small harbour village, can you take on a bigger challenge in a busier hospital? You'll be managing staff with unique personality types and traits, so you'll need to keep an eye on who's being efficient - and who is just a pain in the neck. Balance your workforce with your ambitions as you strive to make profit (and hopefully save some people along the way). Processor - Intel Core i3 6100 or AMD FX-4350® or equivalent AMD® processor.